The contemporary elegance of the Dome Café takes pride of place within the spectacular architecture of the Devonshire Dome. The Dome Café offers a relaxing, modern and casual space to enjoy a range of home-made hot food, sandwiches, snacks and salads. The Dome Café is an ideal place to have a chat with friends over a cup of Costa Coffee with a slice of delicious cake. Our food production is endorsed with a Gold-standard recognition from the Heart of Derbyshire healthy eating scheme. With breakfast served from 8.30am and hot food served from 11.30am, you won’t be short of options. We offer a comprehensive range of light-bites from our salad bowls and baguettes, to burritos and jacket potatoes, and a selection of sweet treats. 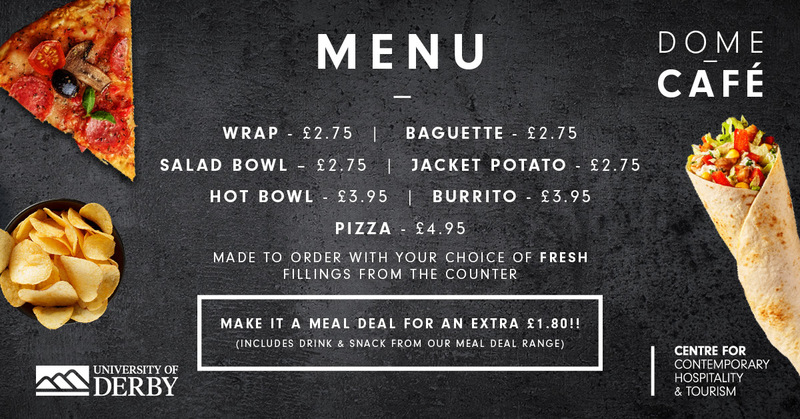 We also have a range of meal deals available. We recognise the importance of dietary requirements to our customers and have an assortment of healthy snacks and gluten-free cakes to enjoy.